Automated Guided Vehicles (AGV), popularly known as battery-powered driverless vehicles. AGVs are becoming an integral part of automated manufacturing systems. They are with programming capabilities for destination, path location, and positioning. The AGVS belong to a class of highly flexible, intel1igent versatile materialhandling systems used for materials loading and unloading throughout the facility. Automated Guided Vehicle (AGV) is the advanced material handling applications. AGV play an important part in automating the manufacturing unit because they not only connect all faces of the factory by the horizontal movement of materials, but allow management to control and direct manufacturing processes. In this system, all the transactions and AGVS vehicle movements are controlled and monitored by the system controller. The guide path controller controls the guide path of the AGVS and transfers the information to the AGVS process controller. 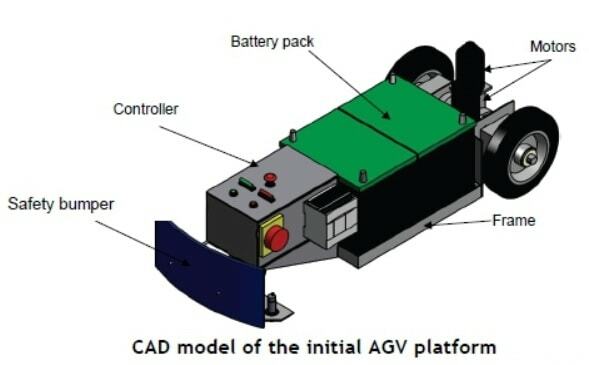 The AGVS process controller directs the movement of the AGVS vehicles. developed as technology improves and as experience is gained. AGV systems are proving to be the most economical method of moving material. AGV systems are designed to interface with other material-handling systems including conveyors, automatic storage/retrieval systems, production lines, and other devices. Computer control means planned delivery, transaction audit records, on-line interface to production and inventory control systems and management information on the vehicle and workstation production. In cases where driverless vehicles are used, substantial savings are realized due to labor reduction. As material movement needs change or plant size increases, AGV systems can be expanded or modified quickly and at low cost. As material movement needs an increase, load movement capacity in the AGV system is easily accomplished by adding one or more vehicles. Control wires for AGV systems are installed in the floor and therefore, leave no ‘above-floor obstructions’. AGV systems can be designed with an unlimited number of pick-up and delivery points. There is less product and equipment damage when AGV systems are used to move material because the vehicles travel on a predetermined route. All automatic guided vehicles are equipped to allow manual override for the special material or vehicle movement situations. AGV systems require very little energy to operate. AGV systems can be installed in less time than most other material handling systems. AGV systems can be installed in existing buildings with minimum interference to ongoing operations.